Multi-parameter data acquisition is key to the modern era of science research. I, for one, wish every single experiment that I design would give me the maximum amount of information. For example, in cell biology and immunology, we want to capture as much information (be it cytokines/hormones/chemokines) as possible about a given cell population. Of course, you could run western blot detection assay, which is highly sensitive. However, it’s a bit time consuming and not designed to detect an array of signals. What about ELISA? Yes, Enzyme Linked Immunosorbent Assay (ELISA) is still the “gold standard” for protein detection. But, imagine if you wanted to detect more than 10 proteins at the same time. You would have to coat each individual plate with different cytokine-capturing antibodies or have all the different capturing antibodies customized in one single plate. What else is out there that offers the detection of a wide array of proteins in one single setting? Enter cytometric bead array (CBA). This assay uses a flow cytometer, which offers both sensitivity (because of the lasers and the optics) and speed (fluidics). Today, I would like to share some of my thoughts with doing multiplex cytometric bead array. The basic idea behind the bead-based capture array technology is that each type of bead has a specific protein-capturing antibody conjugated on to its surface. Each antibody has its own specific fluorescent intensity. Sometimes, you can even sort the beads by size. In a single experiment, you incubate your sample with a variety of beads to detect a wide spectrum of proteins of interest (see Figure 1). Based on the fluorescence intensity of the beads (or size), you can determine the specific protein that each bead captured. The good thing about CBA beads is that you can use them with most commercial flow cytometers as long as the machine is equipped with the right laser and optics to excite and detect the CBA beads. This makes the CBA beads quite straightforward to use. Figure 1. Schematics for a CBA assay. Each bead is coated with a monoclonal antibody (capture antibody) specific for one protein and has a distinct fluorescence intensity (fluorescence signature). Following incubation of the beads with the sample, detection antibodies conjugated with a different fluorochrome (purple dot) will be used to detect the proteins. 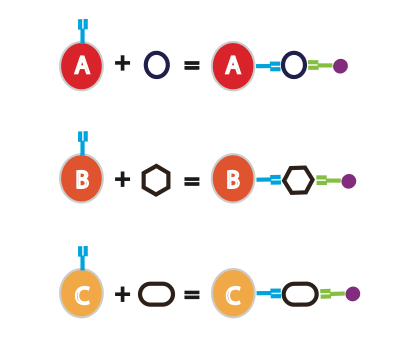 How Is CBA Technology Different from an ELISA? The ELISA is a very robust method for protein quantitation. It uses an enzymatic reaction that produces color. The intensity of the color correlates with the amount of protein present. On the other hand, the cytometric bead array method measures fluorescence intensity using a flow cytometer. It provides a better dynamic range. Additionally, the CBA assay is much quicker and adapts easily for high throughput analysis. Finally, the small sample requirement in a CBA is an advantage over ELISAs, which generally require more sample material. For example, a typical ELISA requires 100–200 ?L of sample for each analyte. CBA only requires 1/5 of that amount and can detect multiple proteins in one setting! CBA beads contain internal dyes with different intensities. The beads are distinguished via one fluorescence parameter and two size discriminators. Therefore, the maximal number of proteins analyzed simultaneously is 30. Another technology, Luminex, uses similar technology to increase this number to hundreds of proteins. It’s sort of like the Ferrari of CBA! The Luminex system uses digital signal processing to detect polystyrene beads that contain different ratios of red and near-infrared fluorophores (2 colors!). So, here the color combination increases exponentially. However, you have to purchase a Luminex machine specifically for this purpose. Next time your samples are limited and you want to maximize the number of proteins you detect, consider a cytometric bead array. However, make sure you research the product first and understand the validation assays you should use to get interpretable results. The technology is robust and sensitive, but can have cross-reactivity if you select the wrong monoclonal antibodies. Therefore, do your research and have fun! Elshal MF and McCoy JP. (2006) Multiplex Bead Array Assays: Performance Evaluation and Comparison of Sensitivity to ELISA. Methods. 38: 317–23. doi:10.1016/j.ymeth.2005.11.010.